Although I can’t carry much of a tune, I certainly do enjoy listening to them. The ones I click to most often on my iPod are those on the “Jewish” playlist – everything from Beth Schafer, David Broza and Julie Silver to Debbie Friedman, Kol B’Seder and the liturgical songs on the Union’s Biennial CDs. If I’m not listening to Jewish music, sometimes I’m writing about it. You can read some of my muscial musings here and here and here. 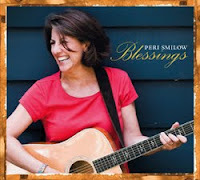 Over the weekend, I received a copy of Blessings, Peri Smilow’s new CD and, needless to say, I've listened to it a few times since then. With its beautiful music, lyrics and sentiments dancing in my head, I’ve decided that Nachshon ben Aminadav, the title character from One Small Step on the Freeom Music Project CD has to take a back seat at least for now (sorry, Nachshon) to Joy, my new favorite offering on the Blessings CD. Fireflies that sing your name. Shelter from the passing rain. That you never lack for love. Guided by the stars above. Home is just a heart away. Better than imagining these tender words set to music, get a copy of the new CD and listen for yourself. I know you won’t be disappointed.